Plenty of East Anglian sunshine with the occasional traditional deluge of rain is literally suiting our hops down to the ground! Apart from some help from the hose during drier spells, plus a bit of evening bine twiddling, they’ve pretty much been left to themselves this year, and we’re really pleased with progress, especially for the little Bramling, which was a late starter. An update on the progress of our three hop plants. Despite me clumsily butchering the roots of the WGV and Fuggles in order to take some quite simple plantable samples for my dear old bruv, all is going very well indeed. The WGV and Fuggles will be used in as many batches of Dark Garden as I can muster in the Autumn. The Bramling Cross is a rather more reserved old stick, and if we get any cones at all for use in aroma additions I’ll be very happy. A short while ago I wrote a post documenting our efforts at growing hops in the Boxshed back garden, and promised an update detailing our amateurish methods of harvesting, processing and storing our yield. There’s nothing all that complex to share really, but there are a few photos you might find interesting, and if you have any inclination at all to plant a few hop varieties this winter or spring, at least you’ll be able to see that harvests, however modest, are at least possible in your first year. We first started getting edgey about our hops around mid-September. The cones had been bright springy and green for a few weeks and were busy putting on bulk and length. Picking a cone at random and peeling back the leaves nearest the cone stem revealed plenty of crocus yellow powder. This lupulin is the resinous pollen-like stuff that imbibes hops with their bittering and aromatic qualities. Throughout the harvesting and drying process its important to realise that too much rough treatment of the cones will mechanically remove much of this lupulin, which obviously isn’t desirable. Pinpointing the perfect time to pick your hops isn’t always easy, but here are a few general rules: wait until the cones lose their springiness and become slightly papery; harvest before or immediately when any browning starts to occur; choose a nice dry day, preferable following a dry period of days. Sadly it began raining constantly in our part of the world just when hops looked ready to pick. We waited a couple of days to see if things brightened up, but when the wild hops nearby began going brown we knew we couldn’t wait any longer for our own plants, and so braved the drizzle and picked them wet. Picking hops takes a lot longer than you might imagine and certainly isn’t a quick job. We began by using scissors and precision, but were very soon grabbing and ripping cones off the bines with care but also speed. The interwoven bines hide a good many cones and an ever-useful fermenting bucket can quickly fill up. By the time we had stripped the WGV plant we had managed to get over a kilo, or 15L or so, of great looking green hop cones, ready for drying. The Fuggles, harvested a few days later, produced slightly less, but still around a kilo. By the time we had stripped our own crop, the enormous mass of wild hedgerow hops I had been watching all summer were perishing, and the rain had showed no signs of relenting. Home brew aficionados such as Dave Line or Randy Mosher can offer guidance for creating a mini-oast out of a tea-chest, wire mesh and perhaps a hair dryer or two. You could even invest in a tiered fruit dehydrator. But we decided to use newspaper pockets and some good old-fashioned airing in the loft. 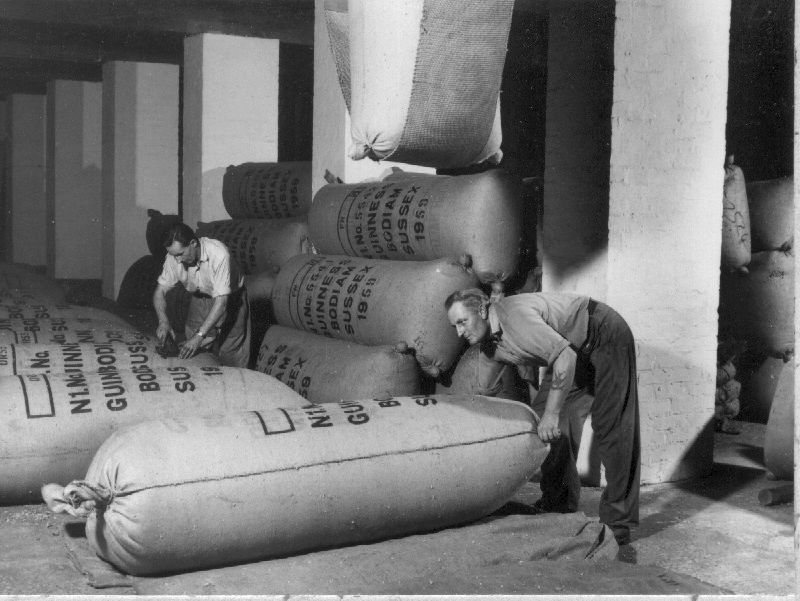 Large flat pillow shaped pockets with sides that contacted the maximum possible number of cones may have worked better, but we simply used cone shaped packages which we then filled loosely with hops and stacked in an airing cupboard. After a few days we took all of these up to the loft and lay out all the semi-dry hops evenly on porous cardboard box sheets where they could benefit from the heat of the house below and some decent airing. At this point, there’s a chance you might start to feel like a bit of a drugs baron. Hops are members of the cannabis family, and after a harvest your home will ooze hoppiness. After a week’s further drying both our hop crops had reduced in weight by around a quarter to a fifth, but still three-quarter filled an FV bucket each. For storage it is ideal to press the hops as compact as possible and then keep them cool. Oast houses use a press to cram and stitch huge volumes of dried hops into large hop pockets, or sacks. Home or craft brewers tend to favour vacuum packing. For such a small harvest we simply bought some extra strong self sealing bags and meticulously rammed them full to bursting with our hops. We managed to press each bucket of hops into two plastic bags with some difficulty, with each of the resulting four bags weighing in at… …just 110g a piece! A lot of effort for less than half a kilo of dried hops you might think, but they are serving us a few brews with enormous satisfaction. We’ve already made a mild with the Fuggles and a stout with the WGV, and the remaining hops are wonderfully fresh and green in the freezer. Also of course, this year was somewhat of a bonus year, as we didn’t really expect a harvest until Autumn 2009. Hop growing is well and truly over for another season. The ugly stripped bines have been ripped down, cut off at ground level and composted. The stem stumps have been buried in organic compost for the winter, and we don’t expect to see buds emerging until the warmth of Spring. As soon as we do, we’ll be sure to post photos. Harvesting take longer than you might think. Don;t shake out all that lovely lupulin! …or indeed down your throat. Cheers! One of the most satisfying parts of our last couple of brewdays has been the chance to use our own homegrown hops. We don’t have a large garden outside the Boxshed by any means, but we do have sufficient fencing to train a few hops, which although not particularly disease resistant, can thrive in the smallest space as long as appropriate varieties are chosen for the local climate. We’re rather lucky in East Anglia. Although we experience a fair amount of high winds and our share of rainstorms all year round, we also have short hard winters and mild weather generally. The soil is rich and easy going, and there are wild hops in the hedgerows and numerous local intensive and organic hop farms. Any of the popular UK varieties traditionally associated with the fields of Kent, East Anglia and the home counties, as well as a few now linked with Eastern Europe and even the cooler parts of North America, will happily grow up some trellis, wire or guttering in any village garden in most regions of the UK. We have three main sources of hops for brewing. Online brew shops selling whole flower, plug or pellet hops from as far afield as California or New Zealand; local hedgerows that come alive in early autumn with large harvests of Susan and Boadicea; and our own three (currently) varieties – Fuggles, WGV and Bramling Cross – planted in Spring 2008. You can buy your own hops online or at a nearby nursery or farm in the form of rhyzomes. These are shoot sending plant stems that are cut from more mature plants and which lay dormant underground in the hard winter before growing root networks and then flourishing above ground from around March until harvest time in late September. Traditionally the first year of hop growth witnesses more action below ground than above, with extensive root systems created at the expense of impressive flower yields. We were rather fortunate in our first year, and did at least manage to take around a kilo of both Fuggles and WGV wet, resulting in a nice sample harvest of 200g+ of each dried and frozen. The Bramling Cross wasn’t so impressive, and although it looked very nice, we didn’t bother harvesting its flowers this year. If you fancy trying your hand at hop growing, it really isn’t very testing and the plants are very attractive and rewarding to take care of. It’s no exaggeration to say that you can actually watch the climbing stems grow at the height of summer. I found for example, that I could take note of how far a creeper had progressed before mowing the lawn and doing a few odd jobs in the garden, then revisit it a few hours later and see it an inch or so further along the fence. Anyway, we are no experts, so if we can get a crop to brew with so can you – here’s how we did it. First we bought three hop plants from a local nursery. This is best done after the last frost and up until late Spring. They cost just a few pounds each, but any friend with established plants ought to be more than happy to cut you off a clump of trailing shoots in the spring, or you could always dig up a chunk from a hedgerow. Wild hop spotting is best done from early summer onwards by bike, when the distinctive green/purple bud-tipped shoots are heading for the sun. The next stage is to dig a minimum two foot square hole for each, lined with John Innes No3 compost or similar. Drop in a plant or rhyzome, cover with soil, and cap with a few inches of organic compost or manure and water in with tomato feed solution or your favourite organic plant food. The only care the plants need from that point on is plenty of water every dry day and feed once a week if you’re feeling generous. Although they’re easy to care for, hop plants do need training, especially if you are growing them horizontally. Left alone, they produce multiple shoots which all head for the sky, binding themselves to the nearest vertical surface and surging up to 40ft without thought of stopping. If, like me, you don’t have the space or energy to purpose build telescopic or pivoting hop frames, I recommend investing in a small piece of trellis, spools of heavy duty coated garden wire and scoops of galvanised eyelet screws to create runs at least two or three fence panels long in parallel lines down your borders. Once your plants have broken the surface and grown around four feet in height, choose around three of the more promising looking creepers, twirl them around some upright trellis, then cut back any remaining stems. This will ensure that growth is concentrated and prevents the plants getting wayward and out of hand. As the season progresses, you’ll find that twiddling and knitting your hop creepers along your wire frames becomes a daily task. This is actually quite fun, and of course ensures you notice any problems, such as powdery mildew, which may need treatment from time to time. By the end of summer, creepers suddenly stop growing at some predetermined but impressive length. By now each plant resembles a bush, and fluffy buds pop out all over – seemingly overnight. These are the beginnings of the all important hop flowers, and they will continue to grow until they become large fragrant bright green hop cones by early Autumn. Another day we’ll try and remember to talk about amateur methods of harvesting, processing and storing hops, but for now, here are the few photos of our own hops and some local hedgerow hops we took over the summer.